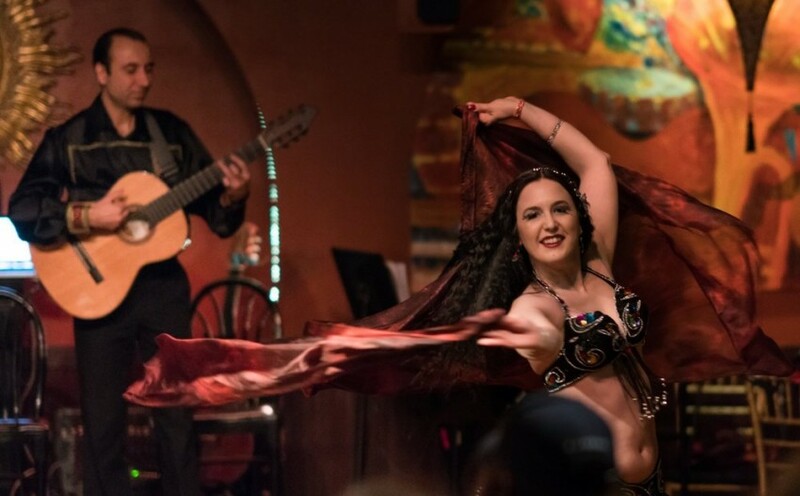 Cabaret style belly dancer available for events, lessons, choreography, and more! Andromeda strives to bring fun, professionalism, excitement, elegance, and an air of intrigue to your special event! Andromeda has performed professionally as a soloist and corps dancer with Daughters of Rhea at corporate functions, celebrity weddings, birthday parties, and other special events at restaurants, function halls, and 5-star hotels in and around Boston. She performed in Plaka under the Acropolis at Geros Tou Moria taverna in Athens, Greece on a recent trip to Europe. Most recent local appearances include live music shows at Karoun with the Fred Elias Ensemble and Lux Hookah Lounge in Plymouth. Andromeda strives to bring fun, professionalism, excitement, elegance, and an air of intrigue to your special event! Andromeda began dancing as soon as she could walk at age 2, attending the Scalzi School of Dance for 16 years. There she studied ballet, jazz, tap, modern, lyrical, hip hop, etc. and danced competitively in high school. She was also a cheerleading captain (and flyer) at Newton North High School where she placed with her team in state competitions. 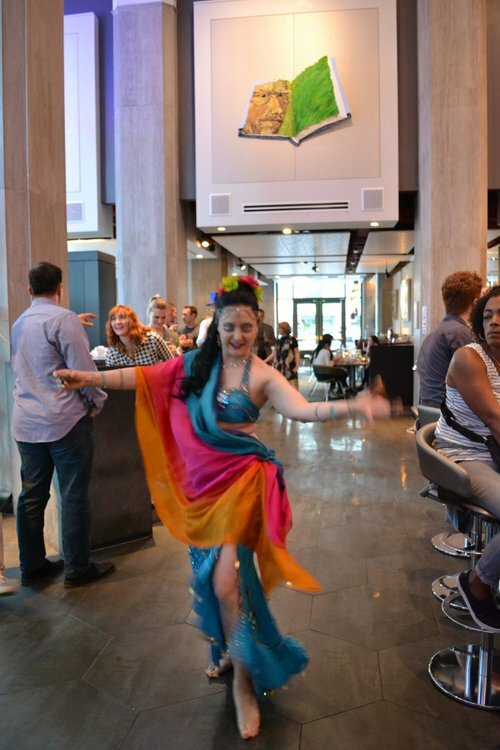 Years later after graduating from Emerson College with a Bachelor of Arts, she caught the belly dancing bug and hasn't stopped since! Her main teacher and mentor is Melina of Daughters of Rhea, who teaches a unique Greco-Turkish style of the ancient dance. Always keen to broaden her repertoire, she has studied with Piper of Daughters of Rhea, Rhea of Greece, Najmat, Sabine, Yasmina Ramzy, Elena Lentini, Ela Rogers, Riskallah Riad, Lisa Zahiya, Alanah, Aszmara, Artemis Mourat, Luna of Cairo, and many more. Please consult Andromeda about your sound system requirements. Available to dance with live bands, hook up to your sound system via ipod, or she can bring a portable Bose sound dock speaker. March 02, 2019 • 8:45pm - 9:15pm Andromeda at the Athenian Corner! February 09, 2019 • 8:45pm - 9:15pm Andromeda at the Athenian Corner! January 05, 2019 • 8:45pm - 9:45pm Andromeda at the Athenian Corner! December 01, 2018 • 8:45pm - 9:15pm Andromeda at the Athenian Corner! November 17, 2018 • 9:00pm - 10:00pm Private Birthday Party at the House of Blues! October 26, 2018 • 8:00pm - 10:00pm Fundraiser Event at the Taj! October 06, 2018 • 8:45pm - 9:15pm Andromeda at the Athenian Corner! June 30, 2018 • 8:45pm - 9:15pm Andromeda at the Athenian Corner! May 26, 2018 • 10:00pm - 10:30pm Andromeda at Lux Hookah Lounge! May 12, 2018 • 8:45pm - 9:15pm Andromeda at the Athenian Corner! May 05, 2018 • 6:30pm - 8:30pm Green Street Studios Showcase! April 28, 2018 • 10:00pm - 10:30pm Andromeda at Lux Hookah Lounge! April 27, 2018 • 6:00pm - 9:00pm Newton Dancing with the Stars! March 23, 2018 • 8:30pm - 9:00pm Andromeda at the Athenian Corner! March 17, 2018 • 7:00pm - 8:30pm Moody Street Circus Presents "A Moment Apart"
January 19, 2018 • 8:45pm - 9:15pm Andromeda at the Athenian Corner! October 28, 2017 • 8:45pm - 9:15pm Andromeda at the Athenian Corner! September 30, 2017 • 10:00pm - 10:30pm Andromeda at Lux Hookah Lounge! August 18, 2017 • 8:30pm - 9:00pm Andromeda at the Athenian Corner! July 29, 2017 • 10:00pm - 10:30pm Andromeda at Lux Hookah Lounge! June 23, 2017 • 8:45pm - 9:15pm Fred Elias 95th Birthday at Athenian Corner! June 20, 2017 • 8:00pm - 10:00pm June Jubilee at Karoun - Last Karoun Performance! June 03, 2017 • 8:45pm - 9:15pm Andromeda at the Athenian Corner! May 20, 2017 • 7:00pm - 9:00pm "Around the World" with Moody Street Circus Co.
May 19, 2017 • 7:00pm - 9:00pm "Around the World" with Moody Street Circus Co.
May 07, 2017 • 5:00pm - 7:00pm Bellybeat Present's "FIVE" at the BU Theater! April 28, 2017 • 6:00pm - 9:00pm Newton Dancing with the Stars! April 22, 2017 • 10:30pm - 11:00pm Andromeda at Lux Hookah Lounge! April 08, 2017 • 8:45pm - 9:15pm Andromeda at the Athenian Corner! October 29, 2016 • 10:00pm - 10:30pm Andromed at Lux Hookah Lounge! September 16, 2016 • 8:00pm - 10:00pm Andromeda at the Athenian Corner! August 13, 2016 • 10:00pm - 10:30pm Andromed at Lux Hookah Lounge! August 06, 2016 • 8:00pm - 10:30pm Andromeda at Karoun! August 05, 2016 • 8:00pm - 10:00pm Andromeda at the Athenian Corner! Fast Songs to Get the Party Started!